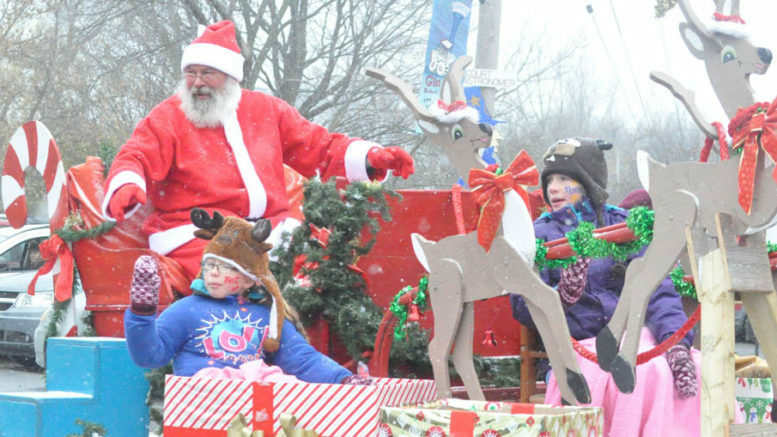 Typically the site of the first Santa Claus parade in Prince Edward County each year, Consecon is preparing to go without ending 35 years of tradition. “It’s done and dusted — unless someone steps forward to revive it for next year,” Consecon Area Ratepayers Association (CARA) president Nick Nowitski confirmed to the Gazette this week. With declining volunteer participation, CARA stepped forward last year to recruit people to take part in the parade, assisting the Ameliasburgh recreation committee. The show went on as planned, but for a host of reasons as this year’s date, Nov. 19, drew near it became difficult to continue. Chief among them, Nowitski said, is the toll organizing has taken on overtaxed volunteers. Organizers also encountered some additional red tape when talking to the County about hosting the event. Nowitski, who also sits on the recreation committee, said policy requires all participants to have liability insurance to take part. He said they were asked to have escape routes planned for spectators if a horse spooked during the parade and they also had to detail detour routes when planning to close roads. It became a burden. With respect to the parade itself, organizers were having a more difficult time finding people to enter floats and finding bands to play. Nowitski said the ranks of area pipe bands have diminished as musicians are aging and not wanting to walk the parade route in the cold. Securing pipe bands from out of town was considered, but proved to be a costly measure due to mileage requests. Float entry has also declined, particularly since the Belleville parade is scheduled the same day. Some people would rather wait in Belleville to ensure their floats don’t get damaged, rather than coming to the shores of Wellers Bay and having to fix their entries. Organizers also appealed to participants in other county parades, but found fewer people willing to travel. Despite the disappointment, Nowitski said the recreation committee still wanted to focus on the most important aspect of the day — fun for children — so they’ve scheduled Christmas Activities in Consecon at several locations within the hamlet. Santa Claus will be on hand to visit with children and distribute Advent calendars at the Masonic Lodge between 12-2 p.m. There will also be crafts, activities, hot dogs and hot chocolate. R.J. The Balloon Dude is scheduled to make an appearance. The Consecon library branch and United Church are also planning activities, while the Royal Canadian Legion Branch 509 is planning some entertainment. The recreation committee announced the changes in a recent newspaper advertisement. Nowitski said some people offering feedback were “shocked” by the news, but as yet there hasn’t been a groundswell of people offering help. While he noted with two weeks until the date, time is quickly running out this year, Nowitski is hopeful there will be interest in reinvigorating the tradition next year. Those who may want to participate can e-mail Ray Patterson at kraypat@hotmail.com.